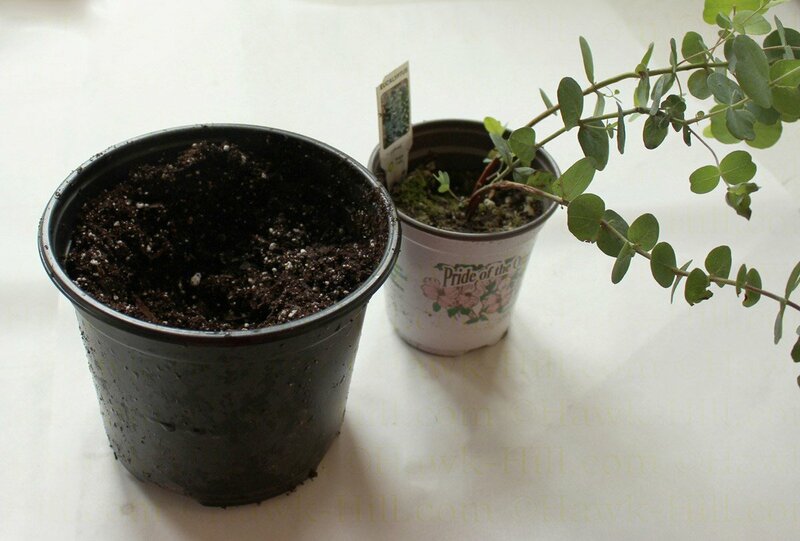 I potted up a new Eucalyptus houseplant today, and I thought I’d take some photos to document a few things I’m doing uniquely or differently in my indoor and outdoor garden lately, while also illustrating how to pot up a small Eucalyptus plant to help give it the room needed to grow large enough for medicinal or botanical cuttings. 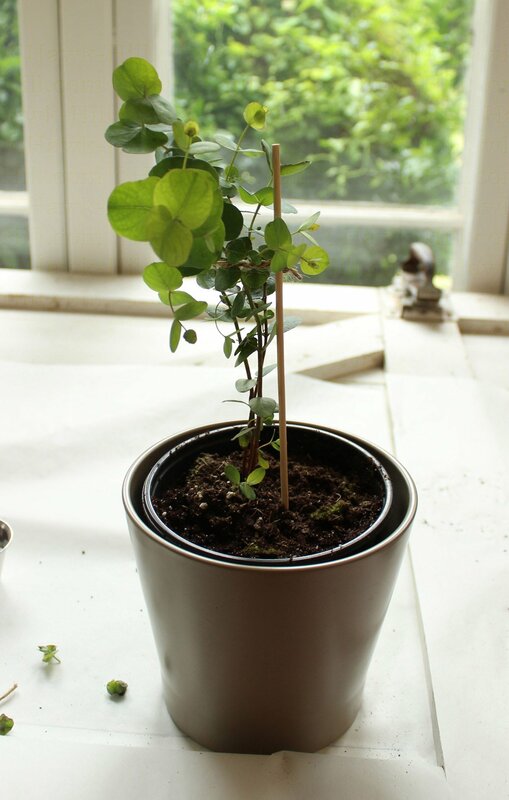 How do I handle eucalyptus (and most other plants) differently than most? 1. 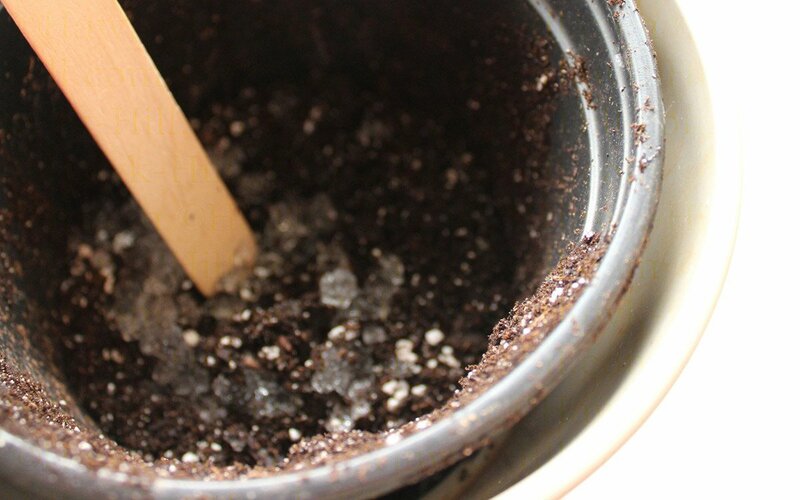 I’m using generic Water Absorbing Polymer to help stabilize soil moisture between plantings. 2. I’m double potting almost everything currently. Planting pots in thin plastic nursery pots means it’s much MUCH easier to rearrange pot arrangements to my liking when I’m staging the plants in my studio or on my deck. 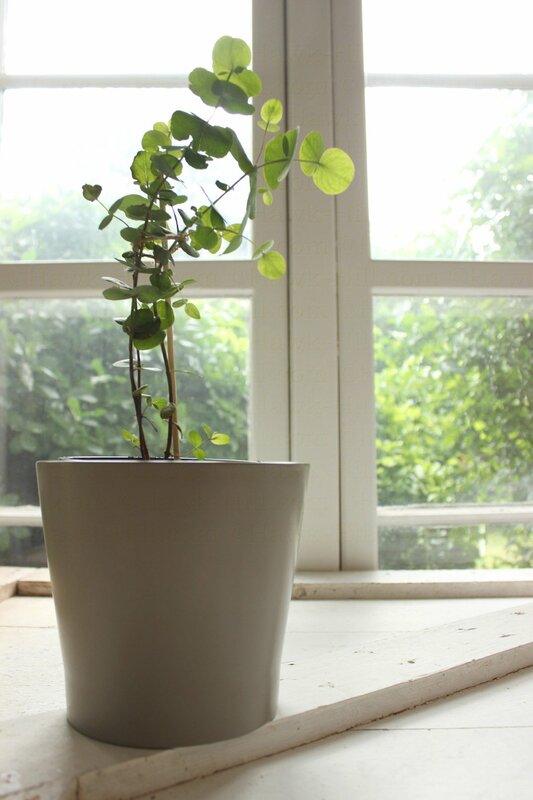 The method I demonstrate here also reduces the risk of over-watering and minimizes mess left by houseplants. Everything (except dirt!) 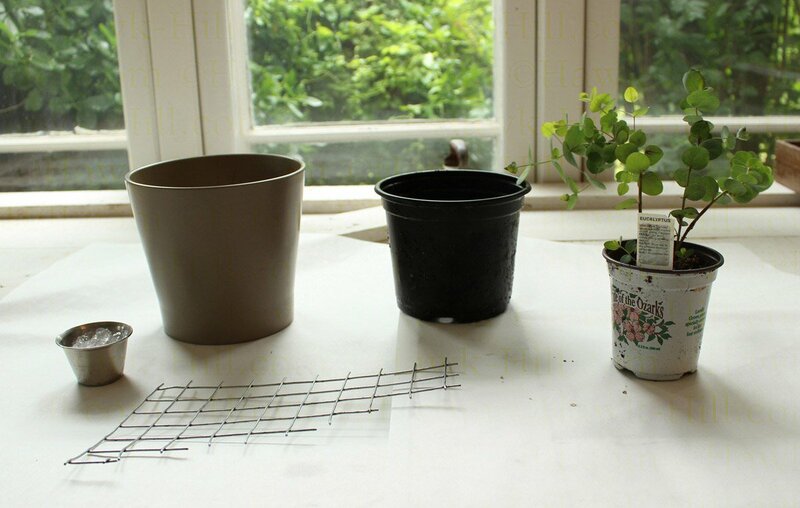 needed to re pot: plant, two nesting pots, water absorbing polymer, and screening to lift inner pot. 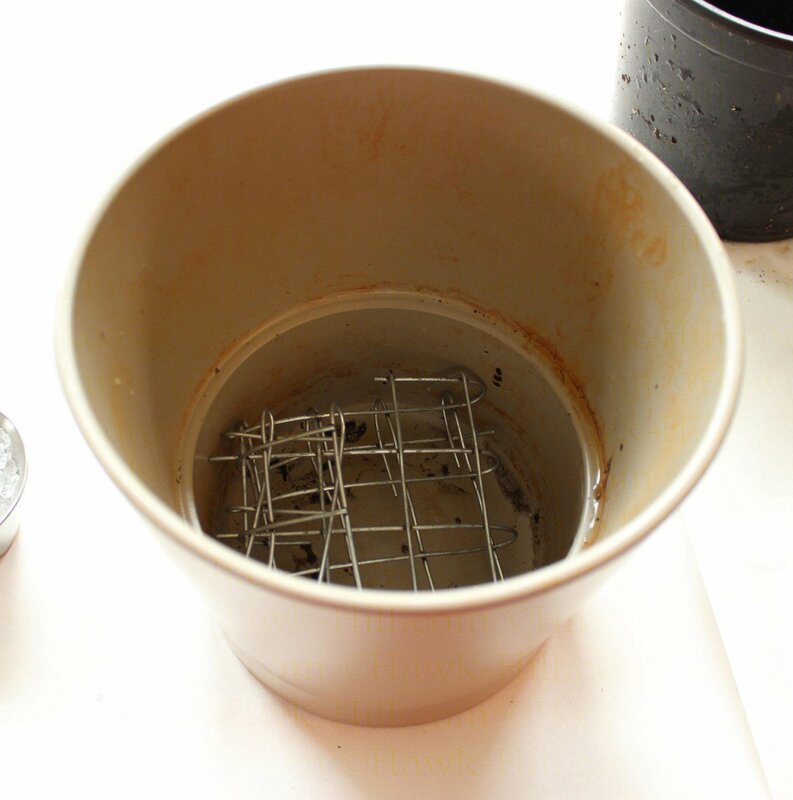 First I smash the screening into the bottom of the larger pot. 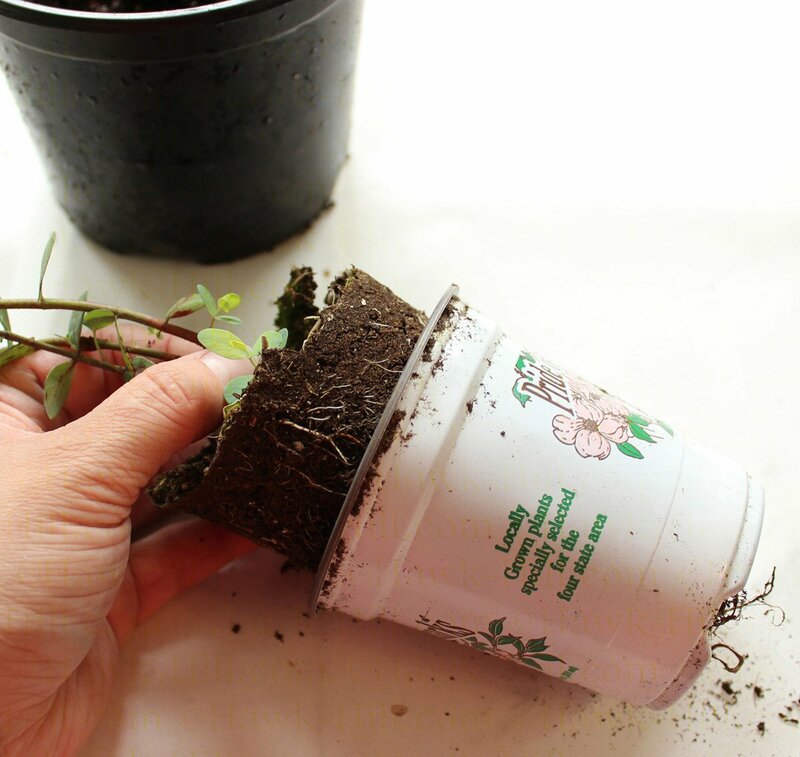 Placed in the bottom of a pot with no holes, this will prevent the inner pot from getting too soggy by allowing excess water drain into the space cleared by the screen. Then I test and make sure my inner pot will sink into the pot deep enough to hid the rim. 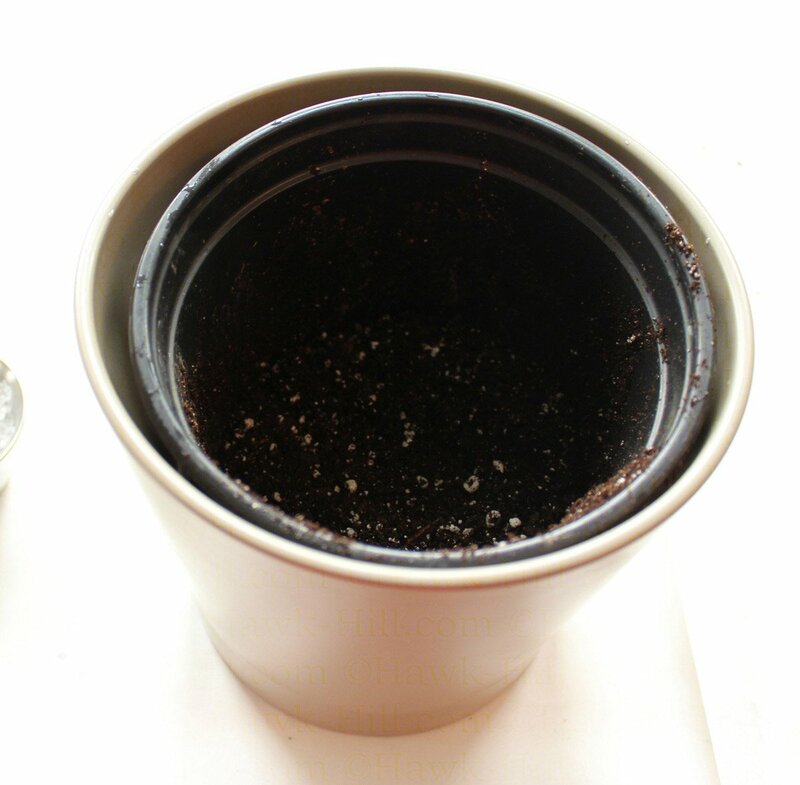 My next step is to fill the inner pot just about 1/3 of the way with potting soil, then add the Water Absorbing Polymer. This stuff is amazing! 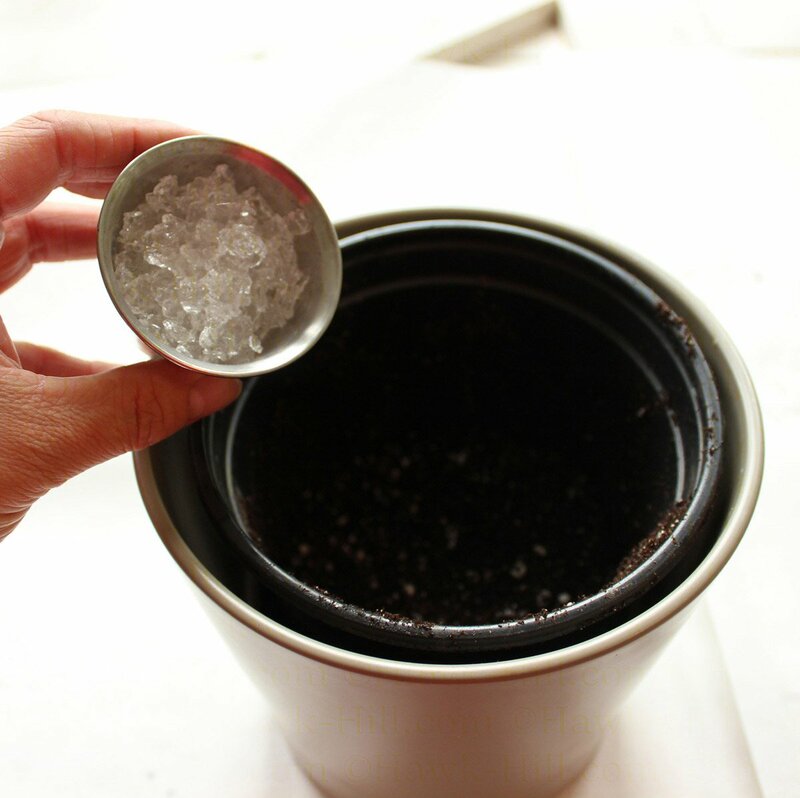 Dry, it’s about the size of a grain of rice, and full soaked each crystal measures .5-1″. 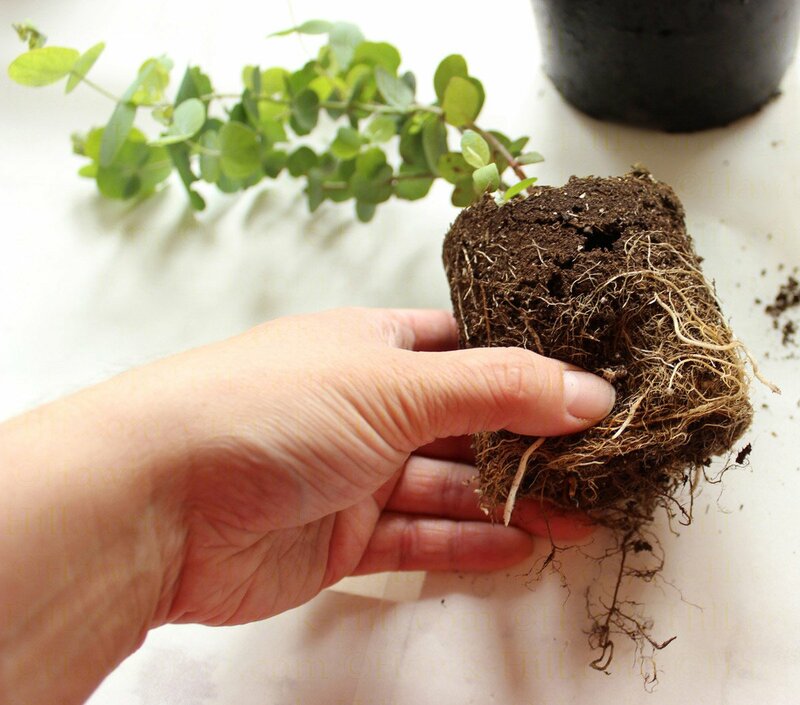 It can absorb impressive quantities of water and hold it until the roots or soils surrounding it becomes dry enough to pull it out. Similar to Miracle Grow “Soil Moist”, the generic stuff works just as well for about 1/2 the cost. Oh! 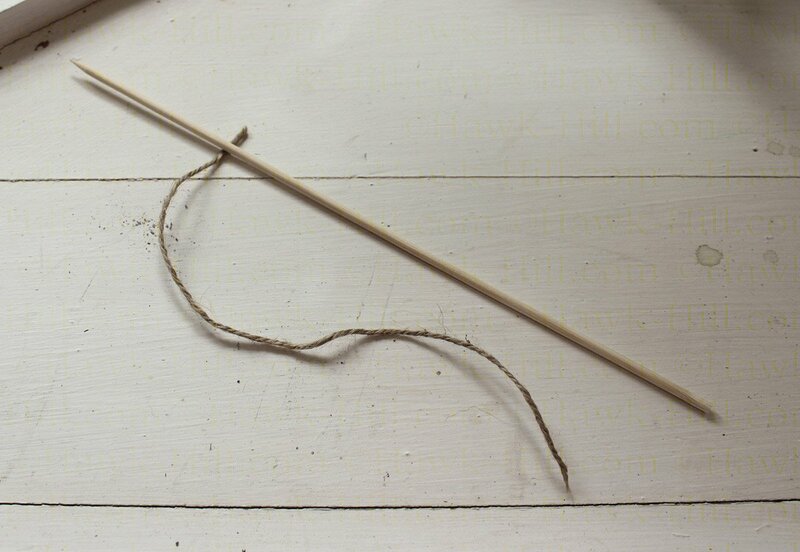 So root-bound! 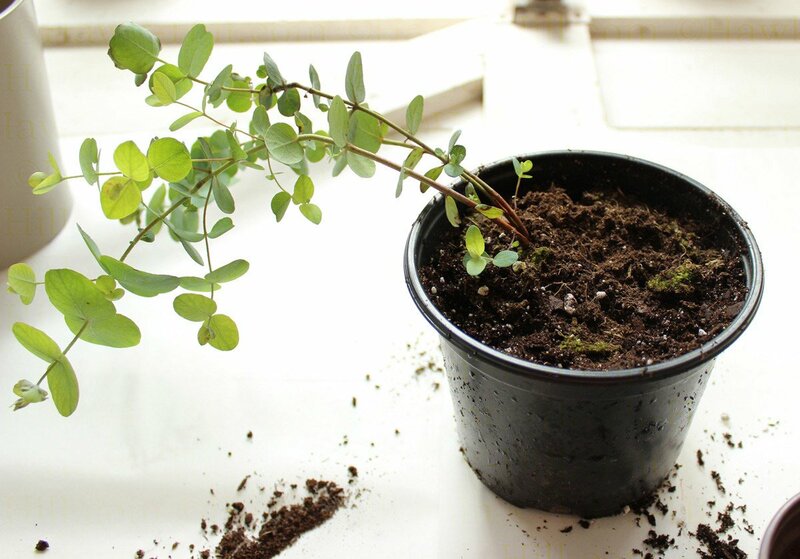 – a clear indication the eucalyptus has been needing a larger pot. 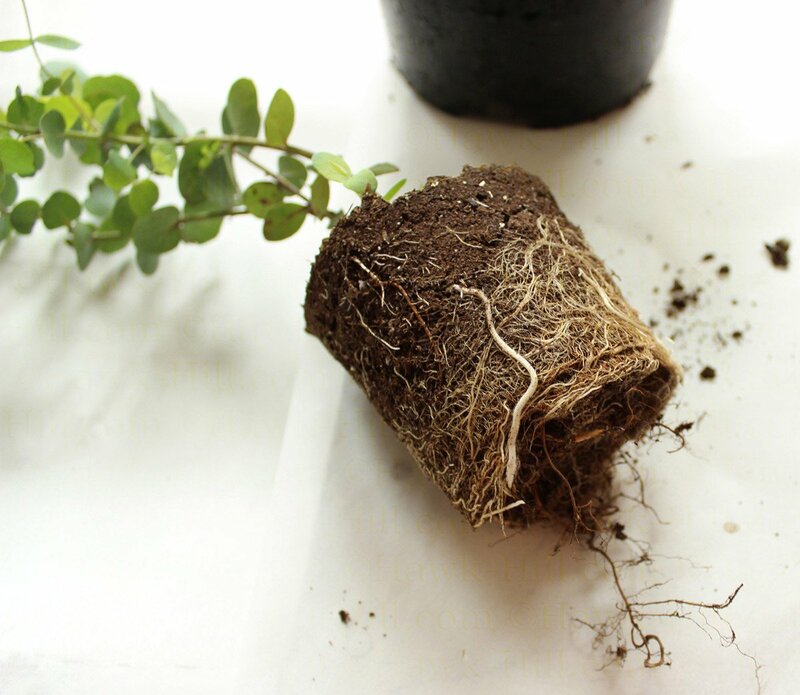 When a plant is this root bound, gentle massage to loosen and redirect roots outward is required. 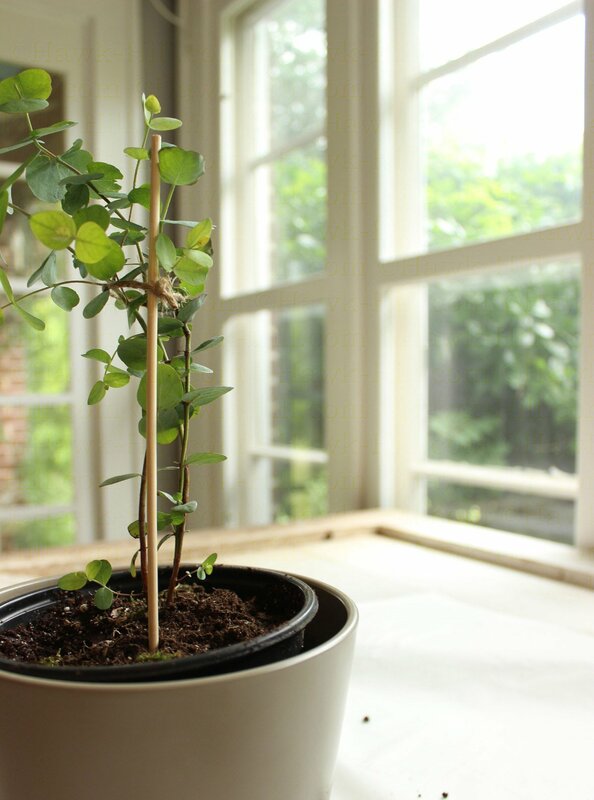 Having planted him in a nursery pot means I can change pot styles with the room or color scheme without having to repot the entire plant!